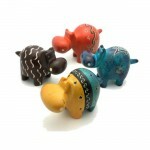 Wholesale Soapstone is mined from great pits in the area surrounding Kiisi, Kenya. The mined soapstone is then delivered to carvers who carve sculptures from the natural stone for the wholesale market, the color of which ranges from cream, to pink, to brown, to yellow, to black, to a marbling of all of them. Once carved, the craftspeople smooth rough edges of the soapstone with sandpaper dipped in water and polish the piece to a high gloss or paint African motifs in brilliant colors with etched accents. 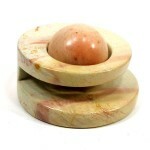 All of the wholesale soapstone products we sell are completely handmade. The tools consist of household items from screwdrivers, hand drills, to switchblades. "Pangas," sword-like tools usually used for cutting down vegetation, are used to cleave the stone in the mines. Soapstone, while very heavy, is very fragile. It is a form of talc, so standing water will affect the carvings. The paint used may also run if subjected to standing water. Light polish keeps it shiny. Chips can be smoothed with water and light grade sandpaper. 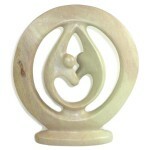 With proper care, soapstone items will last generations.